Never mind all the talk about the revival of the American auto industry. Yes, Chrysler and Ford are thriving. Yes, GM is once again the top-selling brand in the world. But what may be the greatest car the U.S. has ever built is currently a tidy 78 million miles (125 km) away from this world  resting on the edge of Endeavour crater in the southern hemisphere of Mars. 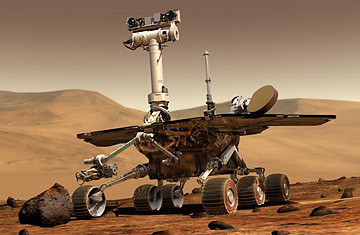 It was on January 25, 2004 that the rover Opportunity  swaddled in its cocoon of shock-absorbing air bags  bounced down on Mars for a mission designed to last a minimum of three months and a maximum of just a year or two. Eight years later, Opportunity is slower, creakier and much, much dirtier, and yet it's still at work, hunkering down on the crater rim as it prepares to ride out another bitter Martian winter. When the relative warmth and sunlight of spring return, the golf-cart-sized rover will resume its wanderings, adding to the mass of data it's already collected about Mars's wet, balmy, and perhaps biologically active past. Opportunity may have shattered all Mars endurance records, but for a while, things were neck and neck. The craft was launched about a month after its twin rover Spirit, and the two arrived on Mars three weeks apart, landing in shallow craters on opposite sides of the planet. Those sites were no accident. It's in Mars's depressions, gullies, ancient riverbeds and deep canyons that water once flowed and pooled. If life existed  or even still exists  it's there that the evidence would be found. But getting around to look for those clues would not be easy. NASA engineers could not simply drive the rovers by remote control, using a joystick and a live feed from the on-board cameras to navigate from place to place. The time it takes for a signal to travel from Earth to Mars varies depending on where the planets are relative to each other as they move through their orbits. At the moment, that communications lag is about seven minutes  one way. For that reason, mission controllers have to survey the terrain around the rovers, plot a precise course to the next destination, and then send an entire packet of instructions up at once. Once the rovers begin moving, their maximum speed is a pokey .1 mph (.17 k/h)  and often a good deal slower. That's why, even after eight years in sometimes constant motion, Opportunity has put just 14 mi. (22 km) on its odometer. Still, added to the 4.8 mi. (7.7 km) Spirit logged before it finally expired on March 22, 2010, that represents a lot of Martian terrain. In the places the rovers have traveled, they've uncovered all manner of telltale clues pointing to Mars's watery past  salts, sedimentary deposits and minerals that are created only in soggy environments. They have also detected water ice on and just beneath the surface. All of this strengthens the theoretical case for Martian life, and all of it makes mission controllers want to wring every sol (or Martian day) they can out of the surviving vehicle  at least until Curiosity, the larger, next-generation rover, which is currently en route, arrives this summer. To keep the very high-tech Opportunity going, NASA is relying on some very low-tech methods. The rover is parked on a sunward side of Endeavour crater, at an outcropping called Greeley Haven. The little trickle of solar warmth that reaches the vehicle should prevent it from freezing over during the winter, and the tiny bit of light that makes it through the dust that now covers its solar panels should provide its systems the minimum power they need to keep going. If the rover is going to get moving again, it must rely on the springtime winds to blow the panels clean, something that has reliably happened every Martian year (about two Earth years) since 2004. But the wintertime downtime is not going to waste. Engineers will analyze the tiny fluctuations in the rover's radio signals to try to learn more about the slight wobbles the planet experiences as it spins  which in turn provides clues to its interior structure. Opportunity will also continue to scan the terrain around it, studying how the wind sculpts the Martian soil. "Wind is the most active process on Mars today," says Diana Blaney, deputy project scientist. "It is harder to watch for changes when the rover is driving every day. We are taking advantage of staying at one place for a while." Eventually, Opportunity  like Spirit before it  will stop someplace and stay there for good. But that time is not here yet, and until it arrives, the aging Mars car will keep sending home all the pictures and readings it can  data that will be studied long after the craft itself has winked out altogether.